Crouched in runners’ stances, good friends Jacob Riley and Quinton Bell smile and give each other the kind of goofy, competitive looks that often mark made-up tests of questionable skills between guys. In a moment, the two teenagers will explode toward the huge rope net in front of them, climb as quickly as they can toward the top of the wooden tree house, and then race to see who will be the first to make it down a 16-foot-slide. When the race ends seconds later, Jacob jumps and raises his hands in triumph as he taunts Quinton, who is momentarily sullen. Yet before long, the focus of the friends changes as they’re raving about the tree house that was the center of Camp Tekakwitha, the interactive theme park of the National Catholic Youth Conference (NCYC) in Indianapolis on Nov. 19-21. “It’s way cool to have something to do like this,” says Jacob, 17, a member of St. Ambrose Parish in Anderson, Ind., in the Lafayette Diocese, the same parish as Quinton. 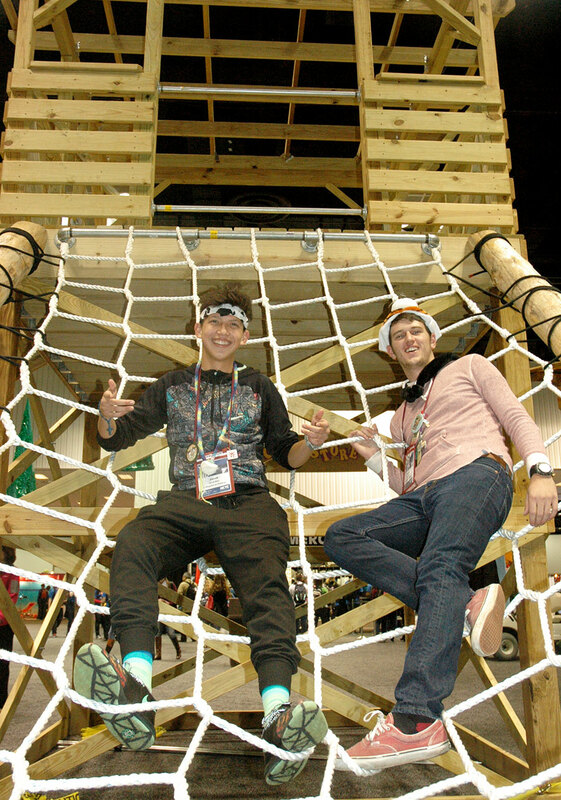 For three days during breaks from the Masses, eucharistic adoration and more serious workshops and faith-filled sessions, the theme park inside the Indiana Convention Center became the place where 23,000 youths from across the United States relaxed, socialized, considered their futures, and played games from their childhood. And the tree house was a big hit, creating smile after smile from the youths who climbed up it and slided down it. Still, no one smiled more by the tree house than Kevin Sullivan, the co-director of Camp Rancho Framasa, the year-round camp of the Catholic Youth Organization (CYO) of the Archdiocese of Indianapolis. When the national conference ended, Sullivan and his staff started the process of taking down the tree house that they built—and a nearby wooden pavilion—so they could reassemble them on the grounds of the CYO camp in Brown County. Sullivan also envisions the pavilion as being a welcome addition to Camp Rancho Framasa. The plan is to reassemble it near the high-ropes area of the camp where campers put on helmets and harnesses for an outdoor adventure near the treetops. “With the pavilion, we’ll be able to keep our equipment cleaner, and it will be a great place to talk about the experience,” Sullivan says. Designing and building the tree house proved to be a great learning experience for the staff at Camp Rancho Framasa, and it became even more memorable when they saw how much it was enjoyed by the youths at the national conference. Striving to strengthen the Catholic faith is a year-round goal for Sullivan and his staff.